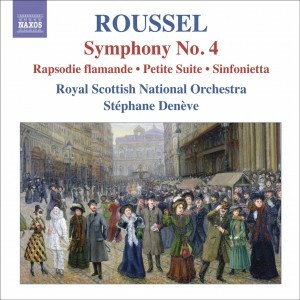 ROUSSEL: Symphony No. 4 / Rapsodie Flamande etc. Released March 2010. Following a period of soul-searching during the mid-1920s, and as his music gained success outside France during the 1930s, Albert Roussel took the rhythmic dynamism, thematic integration and formal lucidity of his Third Symphony (8.570245) to new heights with his less well-known Fourth, notable for its intensely wrought slow movement. The pungent Sinfonietta, the Flemish Rhapsody, which draws on popular songs of the Belgian provinces, the picturesque Petite Suite and the exquisite Concerto for small orchestra showcase the composer’s colourful orchestration and fastidious craftsmanship. An excellent disc, splendidly and idiomatically performed and a superb advertisement for composer, conductor and orchestra. Highly recommended. The Andante, recalling Roussel’s earlier period, is utterly magical in Denève’s hands…there is beautiful playing from the RSNO.